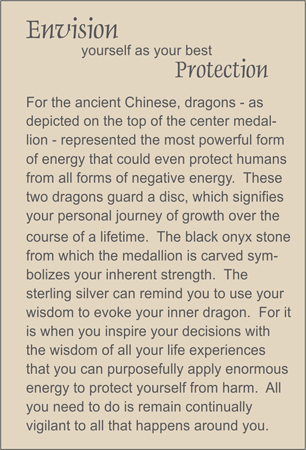 A hand carved black onyx medallion for protection depicts a pair of dragons resting over a disc representing personal growth. A necklace of large simple-cut rock quartz crystal nuggets is accented with faceted black onyx large and small ellipses. Sterling silver toggle clasp.